Voting has recently opened for the Business Moneyfacts Awards 2019. Close Brothers Invoice Finance, part of the FTSE 250 Close Brothers merchant bank, have been the winners of the award for the Best Factoring & invoice Discounting provider, for the last 5 consecutive years. In addition they have recently won Asset Based Lender of the Year 2018 at the Insider - Dealmakers Awards. Quite an achievement. The IDeal™ product remains their flagship, award winning invoice discounting proposition, allowing customers to upload their entire sales ledger from their accounting package, avoiding the need for month end reconciliations. The upload process can even run in the background so that their client has no need to do anything to effect the upload of their latest sales ledger. In addition to invoice discounting, they also offer full service factoring products (prepayments with a credit control service), asset based lending and bad debt protection (which can be added onto their other products). The newly launched "Liquidity Plus" is one of their more recent innovations, offering invoice discounting customers 100% prepayments for the short to medium term, to get them over a cash flow hurdle. With use of funds stated as including: cash flow; growth; stock purchase and acquisition. The example facilities currently shown range from a few hundred thousand pounds of funds in use, up to tens of millions - demonstrating that Close Brothers are able to help the full range of enterprises. IDeal™ - Service charge between 0.2% and 1% of turnover. Factoring - Service charge between 0.5% and 2% of turnover. Discount charge is between 2.5% over LIBOR and 3.5% over LIBOR. IDeal™ - Service charge between 0.1% and 0.4% of turnover. Factoring - Service charge between 0.1% and 0.4% of turnover. 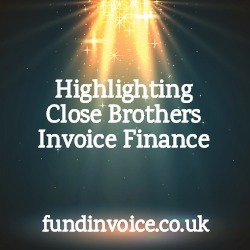 Close Brothers Invoice Finance remain a strong provider within the invoice finance space and one that many customers have praised during our independent market research studies.